Azamara Club Cruises operates two luxury cruise ships and recruits their crew and officers throughout the world. Azamara is one of the five brands operated by Royal Caribbean Cruises Ltd. and they offer itineraries that include Europe, Asia, South America, Caribbean, and Panama Canal. Azamara’s exclusive focus on Destination Immersion means they spend more time in ports than any other cruise line, which gives their guests more time to fully experience the culture, cuisine, scenery, and people of the destinations. 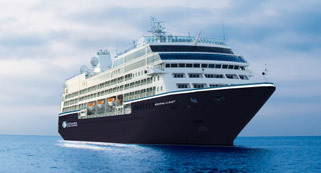 Similar to Royal Caribbean International and Celebrity Cruises, Azamara Club Cruises has an employment website that provides a list of global hiring partners, current vacancies, and details on how to apply with them. Interested applicants may click on “Job Opportunities” or “Search Jobs” on Azamara’s employment pages and be directed to a screen where they may apply online. If the job that interests you is not one of their current vacancies, Azamara encourages applicants to use one of their authorized hiring partners.